Equipped with durable rubber belts of crawlers, the rig is suitable for moving in the city. and allocation. 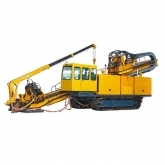 With movable mast, the rig is guaranteed to drill within the full angle scope. It is in good stability with graceful structure. 2. The chassis and mast are high in rigidity and intensity, they are durable and reliable. flexibly according to different geological conditions and performance techniques. the requirement of clients unusually.